Emissions of greenhouse gases, methane and nitrous oxide, in agriculture were reduced by 10.8% from 1986 until 2007. The reduction is mostly the result of decreased cattle and poultry population, as well as modernized slurry treatment systems in large pig farms. 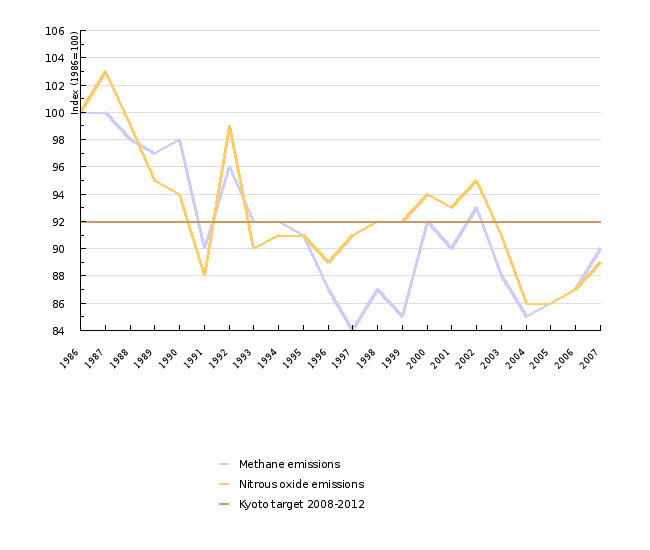 The indicator shows emission trends of greenhouse gases - methane (CH4) and nitrogen oxide (N2O) from agriculture in the period 1986-2007. There is growing evidence that methane and nitrous oxide, like other greenhouse gases, increase the air temperature thus causing global climate change. The latter affects the natural environment and causes enormous damage to the economy, especially agriculture. Data are shown proportionally with reference to the base year 1986 used for calculating Slovenia's commitments to reduce emissions. Emissions were estimated according to the method of IPCC (Intergovernmental Panel on Climate Change) taking into account local peculiarities in the farming practice. Methane and nitrous oxide are the only greenhouse gases monitored with respect to emissions in agriculture. Due to differences in the greenhouse effect, they are recalculated into carbon dioxide equivalents. Methane has a 21-times, and nitrous oxide 310 times stronger greenhouse gas effect than carbon dioxide. Carbon dioxide caused by fossil fuels in agriculture is not monitored by the IPCC method in the agricultural context. It is therefore not dealt with within this indicator. Environmental Agency of the Republic of Slovenia, 2009; European Environment Agency, 2009. Greenhouse gas emissions from agriculture are direct (e.g. creation of methane upon enteric fermentation and upon storing livestock manure, and the formation of nitrous oxide in storing livestock manure, in fertilization with livestock manure and mineral fertilizers, in grazing, biological fixation of nitrogen, upon degradation of crop residues and the cultivation of histosols), and indirect (e.g. as a result of ammonia and NOx deposition from the atmosphere, and as a result of leaching of nitrogen substances into groundwater and rivers). Methane is produced during fermentation of feed in the gastrointestinal tract of domestic animals and during the storage of livestock manure. Due to a relatively large herd and the specificity of digestion, cattle production accounts for around 80% of methane emissions in Slovenia. The largest part of nitrous oxide occurs during the storage of livestock manure and fertilising with livestock and mineral fertilisers. A lot of nitrous oxide is released also from indirect emissions as a result of leaching of nitrogen substances into groundwater and rivers. The annual methane emissions in agriculture between 1986 and 2007 decreased from 60,700 to 54,400 tonnes or by 10.3%, while emissions of nitrous oxide decreased from 3,417 to 3,028 tonnes or 11.4%. Greenhouse effect of both gases, expressed in CO2 equivalents, decreased in this period from 2,334,000 tonnes to 2,082,000 tonnes, or by 10.8%. We are about as successful as the EU-15 countries in reaching the Kyoto targets in agriculture. In absolute terms, the reduction of greenhouse gas emissions was mostly due to cattle production which significantly reduced methane emissions from fermentation in the gastrointestinal tract and nitrous oxide emissions from livestock manure storage. The decrease is primarily attributable to improved efficiency of farming, as we achieve similar physical volume of production with significantly smaller herd than before. The reduction of greenhouse gas emissions is very much the effect of new treatment plants in large pig farms. By introducing more efficient separation of slurry and the construction of anaerobic biogas digesters for the production of biogas, the release of methane per housed animal in storing pig manure was reduced by approximately 20%. The reductions are the result of a lower extent of animal production. Greenhouse gas emissions have not increased in any of the major agricultural sources. A large relative increase in the breeding of small ruminants has little impact on total emissions due to a small proportion in the structure of emissions. Even the increase of emissions on pastures is not a problem, since conversion to the grazing system reduced the emissions from housing and manure storage facilities. The Slovenian legislation does not specifically address greenhouse gas emissions in agriculture. Exceptions are large pig and poultry farms, which under the IPPC Directive have to operate according to the principle of the "best available techniques". Indirectly, the atmosphere is protected by some regulations intended to protect water and soil, especially the Decree on the limit input concentration values of dangerous substances and fertilisers in soil. Indirectly, reduced emissions of nitrous oxide are also attributed to agri-environmental measures launched in 2001 under the Slovenian Agri-Environment Programme. In 2004, they were included in the Rural Development Programme 2004-2006, and they are also included in the Rural Development Programme 2007-2013. Lower emissions indirectly result from specialist tasks in the field of animal husbandry financed by the Ministry of Agriculture, Forestry and Food. Objectives summarized by: the Act Ratifying the Kyoto Protocol to the United Nations Framework Convention on Climate Change. Source database or source: GHG Inventory. GHG Archives. Environmental Agency of the Republic of Slovenia. Methodology and frequency of data collection for the indicator: Data on greenhouse gas emissions are prepared annually before elaborating the report to the United Nations Framework Convention on Climate Change. As the emissions in agriculture can be assessed only after publishing data on the number of animals, the use of mineral fertilisers and the physical scope of agricultural production and breeding (the Statistical Office of the RS), data are available for more than a year ago (e.g. in early 2008 for the year 2006). The preparation of data is the responsibility of the Environmental Agency of the Republic of Slovenia. Data processing methodology: Data are presented proportionally according to the base year 1986 used to assess the commitments of Slovenia for reducing the emissions. Estimates of emissions are prepared with the methods of IPCC (Intergovernmental Panel on Climate Change) taking into account local specificities in farming practices. 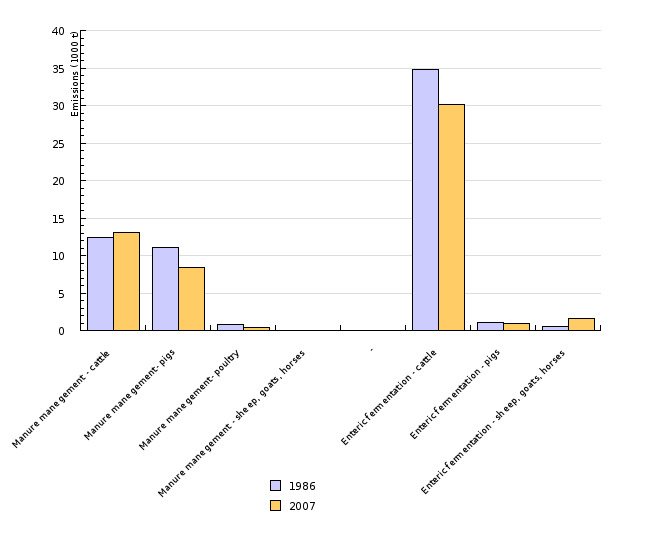 Input data on the scope of agricultural production and breeding are taken from the Statistical Yearbooks and special publications of the Slovenian Statistical Office. Methane and nitrous oxide are the only greenhouse gases monitored with respect to emissions in agriculture. Due to differences in the greenhouse effect, they are recalculated into carbon dioxide equivalents. Methane has a 21-times, and nitrous oxide 310 times stronger greenhouse gas impact than carbon dioxide. Carbon dioxide caused by fossil fuels in agriculture is not monitored by the IPCC method in the agricultural context. It is therefore not dealt with within this indicator. 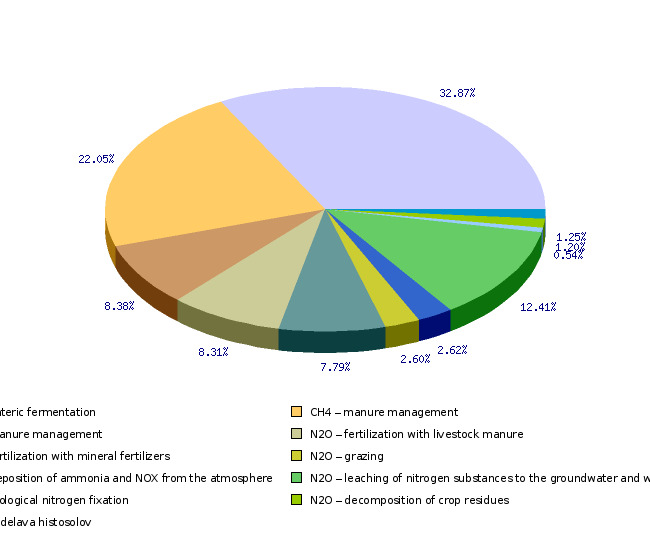 Emission factors for important sources of methane and nitrous oxide were determined within support studies at the Agricultural Institute of Slovenia, which prepared, for the purpose of keeping records, a simplified methodology to estimate greenhouse gas emissions from agriculture (2003). The methodology takes into account numerous professional views on animal feeding and housing systems, and methods of collection and storage of livestock manure. - Advantages and disadvantages of the indicator: The indicator shows the official data whose accuracy and international comparability are regularly monitored by the UNFCCC Secretariat who reports on its findings on a regular basis. Estimates of emissions are prepared separately for each particular year in two independent institutions (Environmental Agency of the Republic of Slovenia, and the Agricultural Institute of Slovenia). In case of inconsistency, an analysis of reasons is carried out and adjustments made. The weakest link in assessing emissions of methane and nitrous oxide is the lack of reliable quantitative data on the farming practices. - Relevance, accuracy, robustness, uncertainty: Data are relevant, as they involve all the major sources of emissions. They are based on the robust method, and results quickly respond to any changes in the scope and types of agricultural production and animal husbandry. Uncertainty is relatively small, but still greater than in other sources of greenhouse gases. Uncertainty of the indicator (scenarios/projections): Projections are elaborated until the year 2030. Uncertainty for projections is rather high. Methodology and frequency of data collection for the indicator: Data are collected annually from national reports to the United Nations Framework Convention on Climate Change. Data processing methodology: Emissions are estimated according to the single methodology of IPCC (Intergovernmental Panel on Climate Change), which allows the use of emission factors adjusted to the national conditions. Geographical coverage: The EU-27 includes the following Member States: Austria, Belgium, Bulgaria, Cyprus, Czech Republic, Denmark, Estonia, Finland, France, Greece, Ireland, Italy, Latvia, Lithuania, Luxembourg, Hungary, Malta, Netherlands, Poland, Portugal, Romania, Slovakia, Slovenia, Spain, Sweden, and United Kingdom. The EU-15 consists of the old EU members: Austria, Belgium, Denmark, Finland, France, Greece, Ireland, Italy, Luxembourg, Germany, Netherlands, Portugal, Spain, Sweden, and United Kingdom. - Indicator advantages and disadvantages (from the point of view of data): The advantage of the indicator is that it is based on official reports of the Member States, that the method of assessment is prescribed, and that national reports are internationally revised on a regular basis. The weakness of the indicator is that the EU Member States do not have their own measured emission coefficients. - Relevance, accuracy, robustness, uncertainty: Data are relevant, since the main sources of emissions from agriculture are identified and taken into account. The method for assessing emissions is uniform, and the national reports are subject to regular international reviews. We believe that the information is accurate, and the uncertainty is higher than in other sources of greenhouse gases. Uncertainty of the indicator (scenarios/projections): Projections are elaborated until the year 2020; uncertainty of projections is rather high. - Environmental Agency of the Republic of Slovenia, 2009. 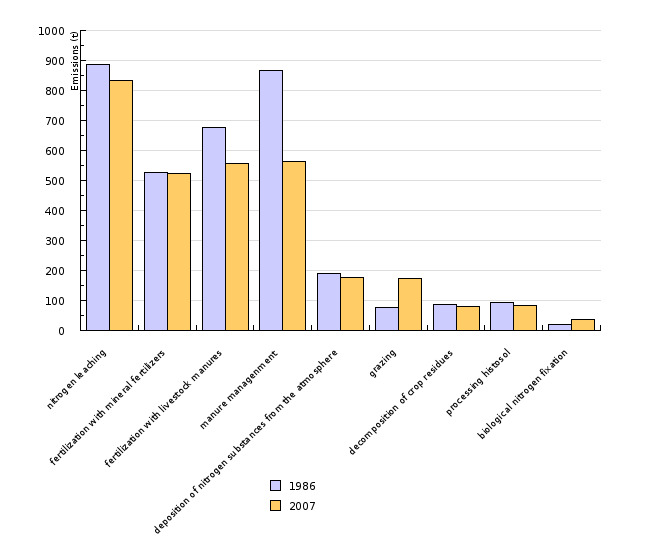 Slovenia’s National Inventory Report 2009. Submission under the United Nations Framework Convention on Climate Change and voluntary submission under the Kyoto Protocol. - the Act Ratifying the Kyoto Protocol to the united Nations Framework Convention on Climate Change (OG RS, 60/02).